Most social workers remember their time in school, learning how to complete a genogram, and even passing the dreaded research class. Perhaps the most memorable is time spent in one's field placement. For most of us, field placement was when we put into practice for the first time all of the knowledge, skills, and values we learned in the classroom—a time to demonstrate our competency as future social workers. Now as practitioners, field education offers us another opportunity: one of teaching and supervising a cohort of social workers. There are several reasons why a social worker might want to take on a student for field education. First, it is a way to give back to the social work profession. The NASW Code of Ethics calls us to give back to the profession and our practice settings by providing competent and ethical supervision and training (NASW, 2018). It is also a great way to give back to one's alma mater. "Becoming a field instructor allows you to pave the way for new social workers by training the next generation. You have the opportunity to shape the future of the profession," says Mary Jacque Carroll, MSW, LICSW, director of field education at the University of Alabama at Birmingham. Second, you can deepen your own knowledge and skills by working with students, who are great sources of new resources they bring from their classes. "Field instructors learn from their students," Carroll adds. "Working with students is an opportunity for you and your agency to stay up to date on research and innovative interventions that students would bring from the classroom." Finally, it is important to note that the Council on Social Work Education (CSWE), the accrediting body for social work educational programs in the United States and Canada, is very clear that field education is not about having a social work intern to help a practitioner or an agency with the workload, but rather is an education and training opportunity for the student, a stance supported by recent guideline changes to internships from the U.S. Department of Labor. As you think about becoming a field educator, it is important to consider the pros and cons. Foremost is the time commitment. Working with a student requires time to supervise, consult, assess work skills, and provide feedback. Agency support is also key to taking on a student. Your organization needs to be willing to provide space and equipment, access to records, and other necessities for a social work student over a period of time, including your own time. Furthermore, students are developing their professional skills, and there is always the possibility of making mistakes or a lack of professionalism, which may be time intensive to correct. On the other hand, being a field educator opens one up to professional development, opportunities for research projects, teaching as an adjunct instructor, and access to expertise for agency-based trainings. Regardless of your reason for taking on a social work student, reflecting on your motivations (as well as those of your agency) will help guide you through the process of becoming a field educator. • Field instructor: One of the most vital roles in a student's education, this person holds the responsibility for guiding students' learning throughout their practicum. While this can seem a daunting task, new field instructors often possess a wealth of knowledge regarding their role, agency, and community to share with the student. Field instructors are typically employed by the agency, which lends to frequent contact with students. 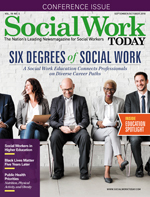 To meet the CSWE's accreditation standards, field instructors must have an MSW from an accredited social work program and have two years of postdegree social work experience (CSWE, 2015). It is important to note these are minimum requirements and each program may impose additional guidelines. A common example of this would be an institution requiring its field instructors to be licensed. • Task supervisor: This is another supervisory position that may assist in students' educational experiences in the agency. A task supervisor may have a social work degree or a closely related human services background that enhances students' educational experiences in the agency. • Faculty liaison: This person is affiliated with the student's educational institution. A faculty liaison, who typically meets with the field instructor and student, is a source of support throughout the internship. • Field coordinator/director: This person or persons are additional supports as well. They are often the ones coordinating internships and overseeing the field program and student placements. All of these positions are designed so that field programs have levels of support available to field instructors and students to answer questions, address concerns, and brainstorm solutions as challenges and opportunities arise. Another helpful step is to become acquainted with the social work educational programs in your geographic area and beyond. Many social work educational programs offer a variety of distance learning options. For example, you may be approached by a university in another state that offers online/distance education to host a student for their field placement at your agency. Being ready to ask about their program, the types of support available, and the learning objectives for the placement will help you in discerning whether this will be a good match for you and your agency. Social work program websites are another great resource. Here, field instructors may find information on upcoming trainings and offerings as well as the type of internships available for students. As a field instructor, you may want to know whether the institution has a BSW program, MSW program, and/or dual and coordinated degrees, as this will determine the types of learning opportunities needed. A third step to becoming a field educator is to attend a training, which are typically hosted by a program's field department and cover many of the basic needs for first-time field instructors, as well as helpful information for veteran instructors. At a minimum, learning about the field office's policies and procedures will help you stay compliant with student learning competencies and hours and may help you feel more confident in your role as a new field instructor. Continuing education may be offered as an added bonus for field instructor training and service. Finally, you will want to know exactly how a field program works with students as they encounter challenges in field placement. While all field programs hope students move successfully through their learning experience, history tells us this is not always the case. Student challenges, such as health problems, professional comportment, changes to their family situation, and financial issues, can range widely. Quality programs will have a plan in place to address issues as they arise and work collaboratively with the placement agency. As Allison Curington, MSW, LCSW, director of field education at the University of Alabama School of Social Work, explains, "Addressing student challenges that arise in field is one of the most time-intensive pieces of the field puzzle. A hallmark of social work is to meet clients where they are and assist them in removing barriers to success. The tension for field programs is to balance our own social work training and practice with holding students accountable to educational competencies and practice behaviors. This becomes even more challenging for field instructors in the agency. Having a clear policy, training all constituents on that policy, and following that policy becomes paramount to field program practice. I find that many students and field instructors who go through our field staffings (a part of our process for handling difficulties in field) often correct the behavior or improve on the skill set addressed." Once you have made the commitment to take on a student, the next step is to prepare yourself and your agency for the student's arrival. Ensuring you have the space—physical space in the agency and time in your schedule—is critical. Supervising students through their field placement is a clinical experience in itself. In fact, some states recognize clinical supervision as continuing education credits. Next, creating an outline of potential activities for students is helpful not only for organizing the agency's opportunities for students but also for describing those opportunities to the field office when promoting your site. Finally, gaining agency approval and endorsement is also important. Hosting a student for placement is like welcoming a pseudoemployee, and you will want the student to be not only welcomed but also embraced into the culture and activities of the agency. Alternatively, if being a field educator doesn't sound like a good fit for you right now, there are other ways to support social work students including providing one-time job shadowing experiences, having students as volunteers, supporting service learning placements, and giving a guest lecture for a class. Most important is finding a way to give back to the profession by supporting the next generation of social workers. — Kimberly Gibson, MSW, LMSW, is the MSW field coordinator at the University of Alabama. Council on Social Work Education. (2015). 2015 Educational Policy and Accreditation Standards for Baccalaureate and Master's Social Work Programs. Alexandria, VA: Council on Social Work Education. Retrieved from http://www.cswe.org/File.aspx?id=81660.